A youth group from Hayes Barton Baptist Church located in Raleigh, North Carolina conducted the worship service at the mission on Wednesday night, June 28. This wonderful and talented group of teenagers led prayers, singing, performed skits and conducted a short sermon for the men at the mission. As always, the men at the mission really loved having youth come and conduct the worship service and demonstrate in so many ways how Jesus loves each of them as do their brothers and sisters in Christ. 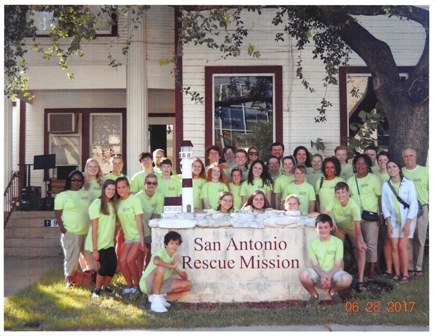 The group was on a five-day mission to San Antonio and also visited the San Antonio Food Bank, Morningside Ministries of the Meadows, a retirement community, Haven for Hope and the Unicorn Center, a facility for developmentally disabled people. You can see pictures and read more on their web site HERE. MANY THANKS to the Hayes Barton Baptist Church youth for providing a wonderful evening for the men at our Mission. The picture was provided by the Reverend Ward Page, Minister to Youth and College Students, who accompanied the group.